First developed by John Browning for use in anti-aircraft machine guns, the .50 BMG (Browning Machine Gun) is a powerful cartridge that can be described as a larger version of the .30-06 Springfield. It is used in the M2 machine gun, which has served in the US military since 1933 in various incarnations, and in a variety of powerful long range rifles such as the McMillan Tac-50 and Barrett M82. Such rifles, though very bulky and heavy, are highly effective against both materiel and enemy personnel at extreme ranges and can also be used to destroy unexploded munitions at a safe distance. Using .50 BMG weapons, US Marine sniper Carlos Hathcock and Canadian Army sniper Rob Furlong both set records for confirmed kills against enemy fighters at distances well in excess of 2,000 yards. 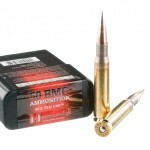 A typical round of .50 BMG ammo fires a very large (600 grains or more) bullet at a muzzle velocity of about 3,000 feet per second. This results in very high felt recoil, but also excellent long range performance that makes this caliber a favorite among precision target shooters. 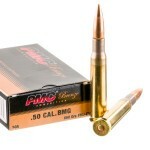 The .50 BMG bullet has a high weight and ballistic coefficient, making it relatively predictable in its point of impact even when crosswinds are present. 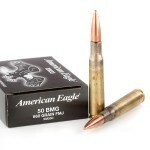 .50 BMG mil-spec ammo is produced by Federal Premium Ammunition, the contract operator of the Lake City Army Ammunition Plant; this ammo is often available to the public as surplus from government orders. PMC also produces a load that is essentially identical to the military one, as well as a match load suitable for target shooting.